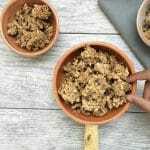 Healthy Homemade Granola Clusters – A healthy snack you’ll you and the kids will absolutely love. They’re made with simple wholesome ingredients that you may already have in your pantry. Healthy Homemade Granola Clusters are the absolute best. These wholesome clusters of goodness are made with a few key ingredients that will make the perfect snack for you and your family. They’re a perfect snack for when you’re at school, work, on the go, or relaxing at home. The oats, organic blue agave, walnuts, and mix of warm spices help curb your appetite before your next meal. 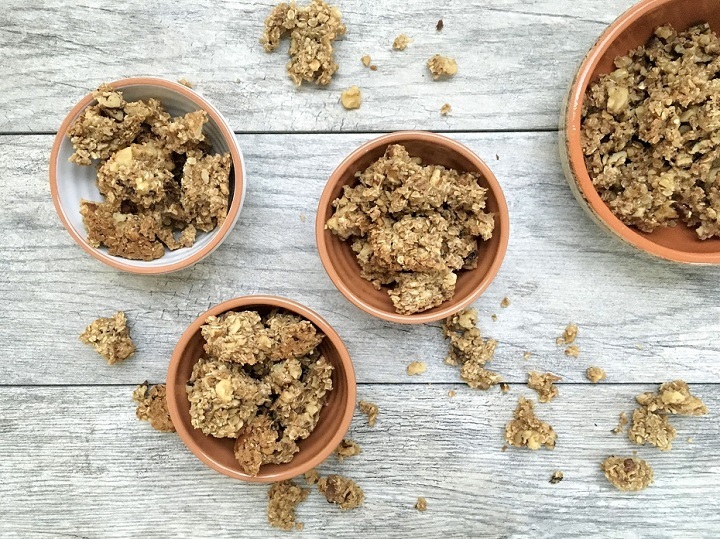 After trying this simple recipe, I doubt if you’ll go back to store bought granola again. This recipe is all around healthier and less expensive than the store bought brands. 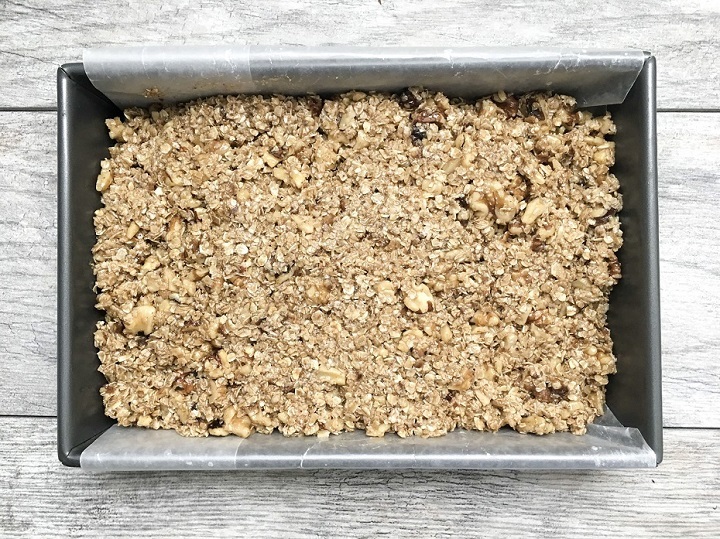 A few ingredients and about 25 minutes of your time you’ll have homemade granola at your finger tips. These clusters are nutritious and all-around Y-U-M-M-Y. Let’s get cracking with all you need to make this batch of deliciousness. Making this recipe goes pretty quickly, so I suggest that you measure out all your ingredients before beginning the process and have your pan ready. I used a a 10 inch by 6 1/2 inch rectangular pan lined with parchment paper. By the way, if you do not have agave, honey will work as well. Also, keep in mind that when making your Healthy Homemade Granola Clusters, you can customize the recipe to your liking. You can add in pecans, dried cranberries, chocolate chips, coconut flakes, or whatever your heart desires. My family prefers less add-ins; however, if I were making it for myself I would add in dried cranberries, pecans, and coconut flakes. For continued freshness, store any left over granola clusters in an air tight food storage container or zip loc bag. 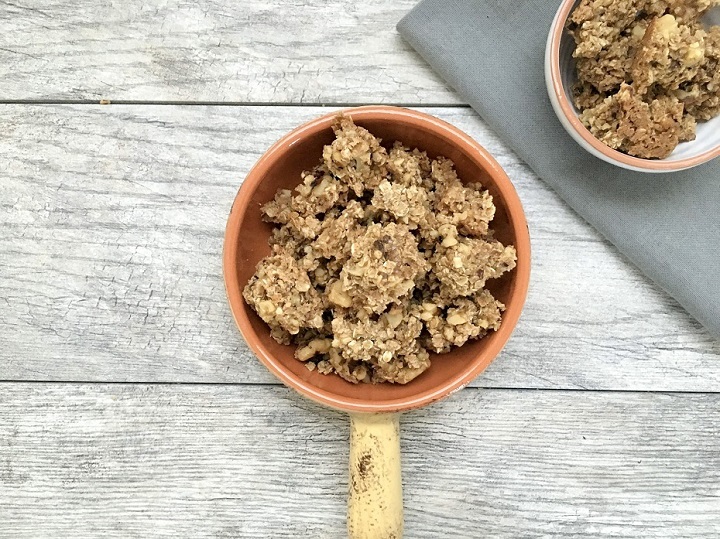 You'll fall in love with these Healthy Homemade Granola Clusters. They're made with wholesome ingredients and are great as a snack or breakfast idea. In a bowl, add quick oats and chopped walnuts (and other add-ins). Mix . Set aside. 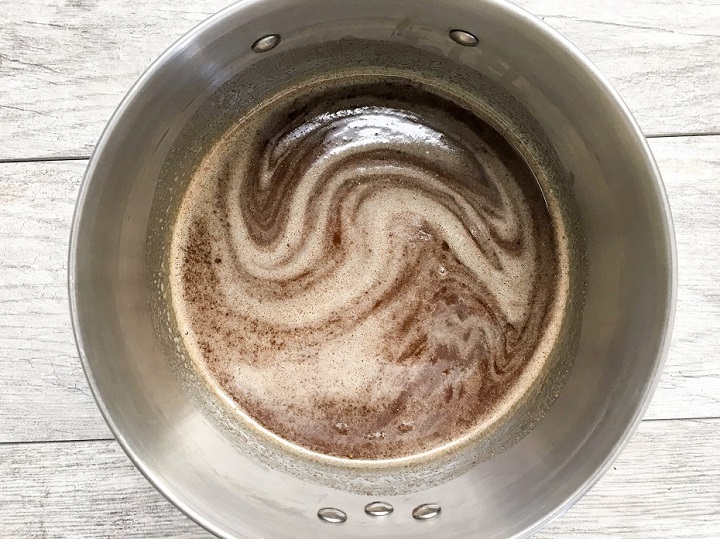 In a saucepan over medium heat, add brown sugar, agave, vanilla extract, cinnamon, pumpkin spice, ginger and stir until brown sugar has melted and all ingredients are incorporated. 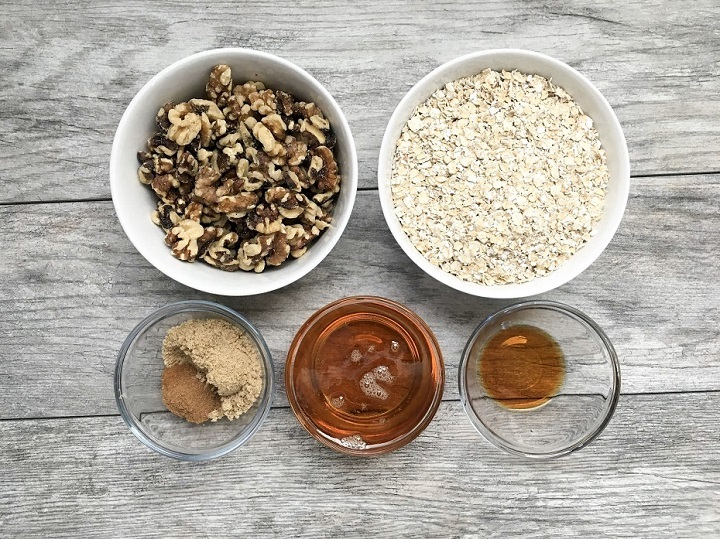 Then, add liquid ingredients to the bowl of quick oats and walnuts, stir until quick oats are coated with liquid mixture. Scoop combined ingredients into a small pan. Run your fingers under the water and shake off excess water. With damp fingers, press combined ingredients firmly. (Having damp fingers will prevent combined ingredients from sticking as you press firmly). Bake in your preheated oven for 17-20 minutes. Let granola cool in pan for 10 - 15 minutes. 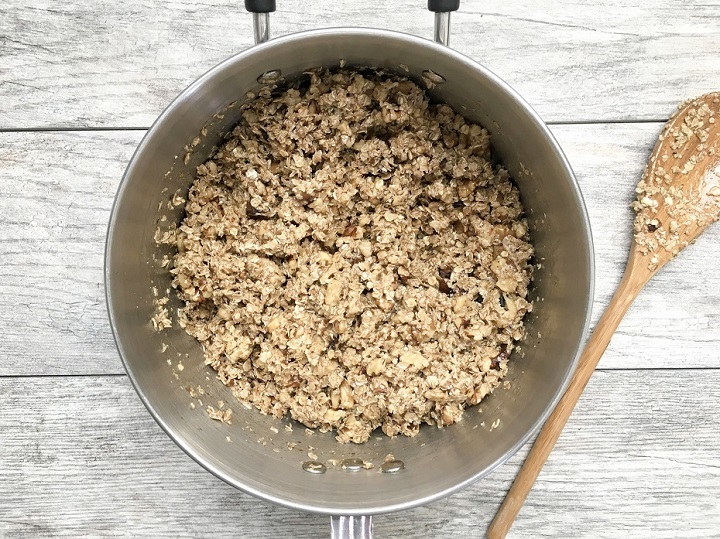 Lift out of pan by parchment paper, Cut or break granola apart into clusters using a butter knife. Enjoy. Store any left over granola in an airtight container or a zip loc bag. Granola is still delicious and fresh the next day.